When we visited Maine, I ate lobster every day. 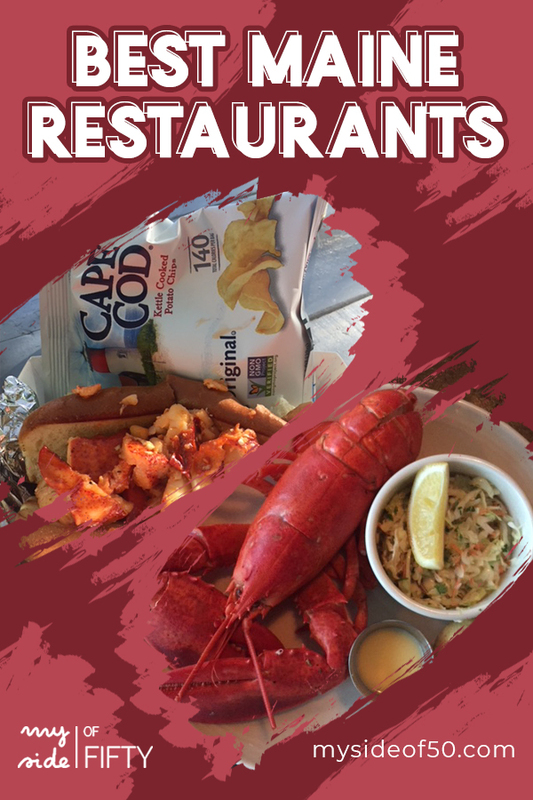 Boiled Lobster, Lobster Rolls, Lobster Salad, Lobster Bisque, Lobster Wrap. Every. Day. And I loved it. I never got tired of it. What can I say? I LOVE Lobster! But there are plenty of great places to eat with all kinds of food. 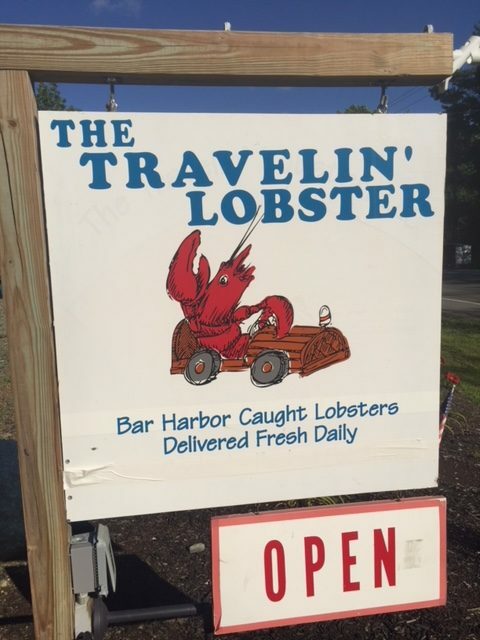 Thanks to a little research and recommendations from a friend who is a Maine resident AND a foodie, we didn’t have a bad meal the whole time we were there. 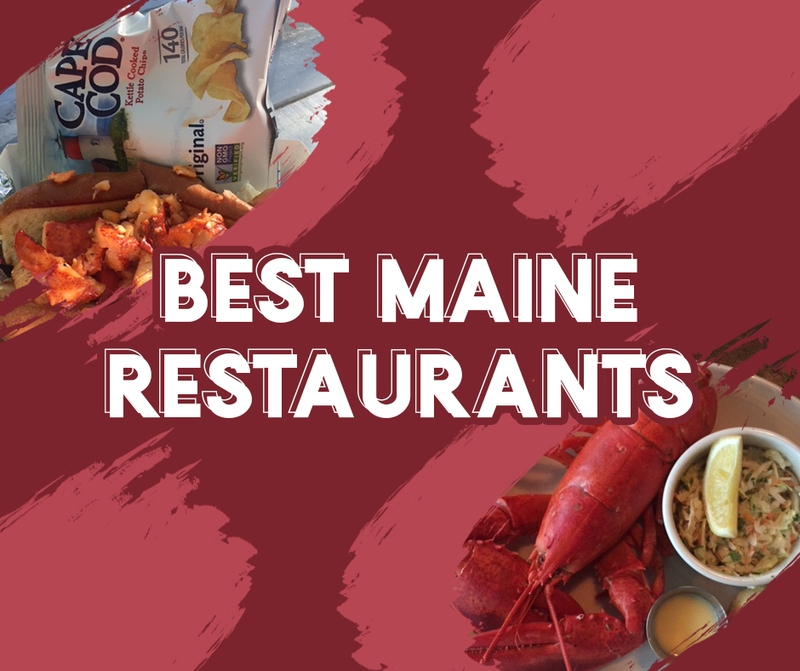 So today I offer you my recommendations for the Best Maine Restaurants. Our vacation in Maine started in Portland. Our first morning there, we had the option of eating at the high priced and and not all that appealing breakfast buffet in our hotel. That wouldn’t do, so we asked one of the employees at the front desk for a recommendation. 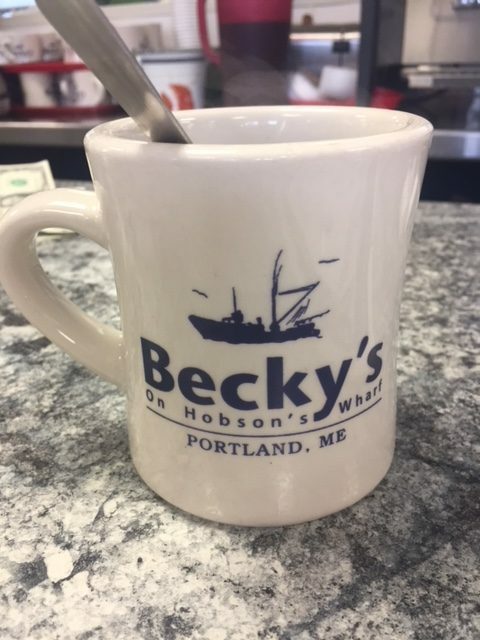 He sent us on a short walk down to the waterfront where we had the most delicious breakfast at Becky’s Diner. This family-owned establishment was featured in Diners, Drive-Ins and Dives. It’s not a fancy place. It’s obvious that the locals eat there. First-responders, fishermen, young professionals, families. There was a slight wait to get in, but we took a table at the counter, which was great for people watching. When we sat down we were served coffee in these huge, substantial (heavy) mugs. I loved the vibe of the place. We didn’t get fancy with our order – eggs, bacon, sausage and an English muffin – all cooked to perfection. But the highlight for me was that the sausage they served was Italian sausage – some of the best I’ve ever tasted. And the price! Tony and I got out of there for $14! For two full breakfasts and coffee! I think we’d pay more for that same breakfast at our local Denny’s. Great food. Great service. Great price. 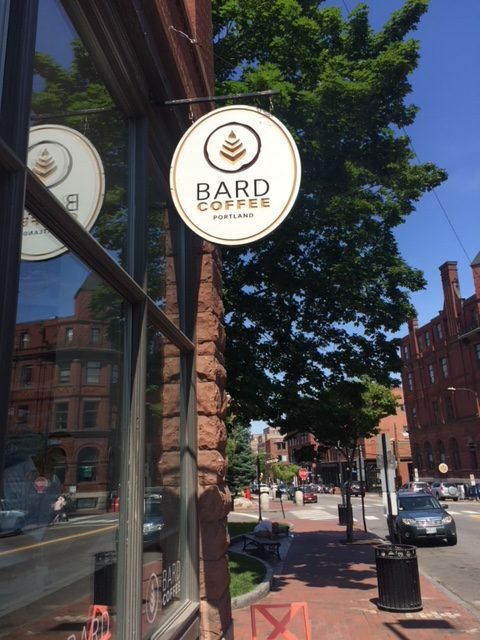 After sightseeing later that afternoon, it was time for a coffee break, so we stopped in at Bard Coffee. I tried Nitrogen Cold Brew for the first time and it was so delicious and smooth. The coffee shop itself isn’t much to speak of. Not a lot of extras like you would find at a Starbucks, but really good coffee. And they had a beautiful sitting area with some big trees outside. 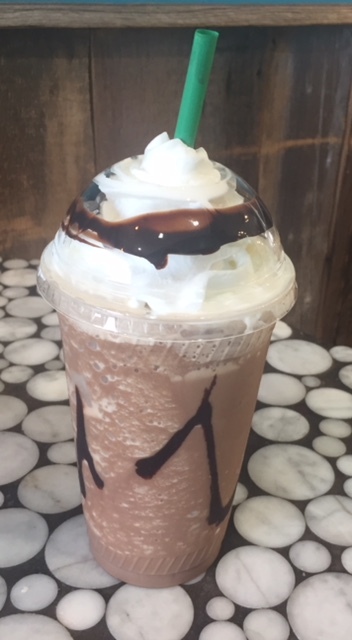 Perfect for enjoying a nice day and looking at the old historic buildings in downtown Portland. Scales was highly recommended by my friend who lives in the Portland area and it did not disappoint. It’s located on the wharf amid a lot of restaurants and bars and LITTLE parking, so walk or take an Uber. Their website says they offer complimentary valet parking during the dinner hour, so check on that if you plan to drive. 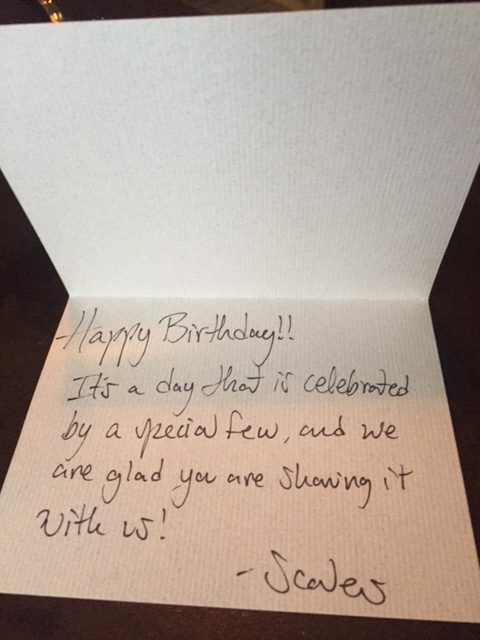 Since this is such a popular place, I made a reservation online several weeks before.They asked if we were celebrating a special occasion and I told them we were celebrating my 60th birthday. The restaurant has sort of an industrial decor. Lots of light, open space and fresh seafood on display. It was crowded and the tables were very close together. We were seated in the back, right by the kitchen door. When I asked to be moved to a different table, they graciously accommodated us. We began with some delicious cocktails and looked at the appetizer menu which featured the classics you would expect like steamed clams and oysters. But they also offered several items with a twist – Grilled Octopus with Chorizo and Fried Squid with Cherry Peppers. 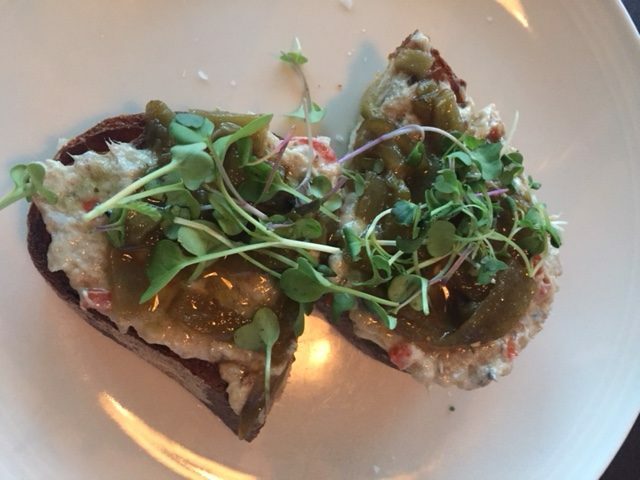 We split the Smoked Bluefish Pate which was made with grilled poblano pepper relish and served on toasted sourdough. To. Die. For. Our entrees were more traditional. Boiled Lobster for me and Fish & Chips for Tony. Both were delightful. After dinner they served us a special birthday dessert, which was not totally unexpected. But what was a surprise was this nice note and visit from the manager who was also a fellow Texan. Small world. We had a great experience at Scales and I’d go back there any time! Taking and Alaskan Cruise? Get my Packing List here! The next day, we started driving up the coast to Bar Harbor and got hungry for lunch around Rockland. 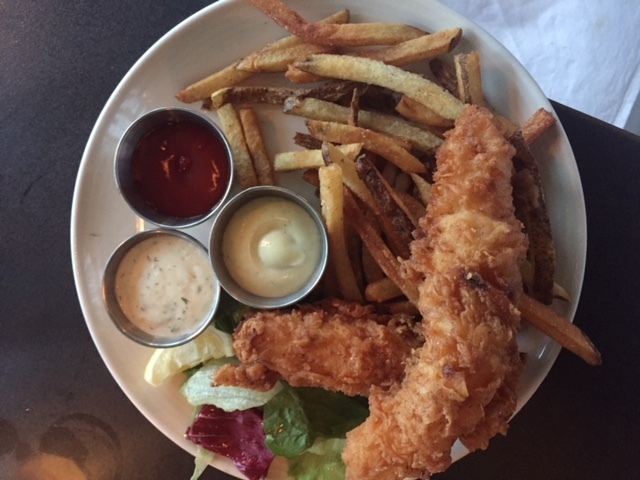 Our recommendation for lunch came from good old YELP – Hill’s Seafood Company. 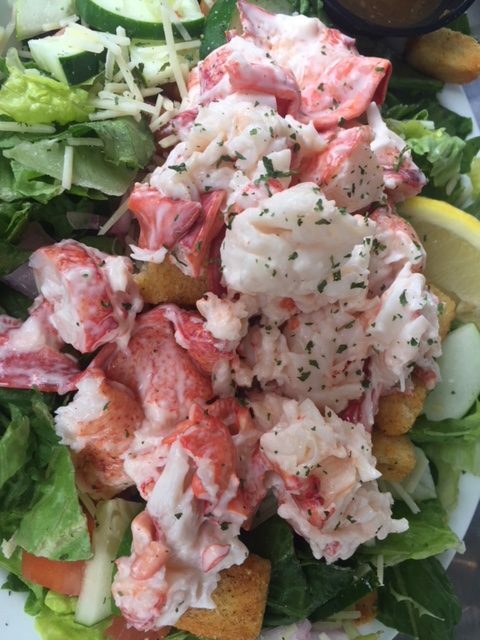 We sat outside where we could see the marina and enjoyed Lobster Salad. Super fresh and chock full of lobster. After lunch, we walked next door to Rock City Coffee. They roast their coffee right on the premises and the place smells divine. I got my after lunch caffeine jolt and picked up a pound of freshly ground coffee to take with us to our rental in Bar Harbor. Delicious, robust coffee that comes in lots of varieties. 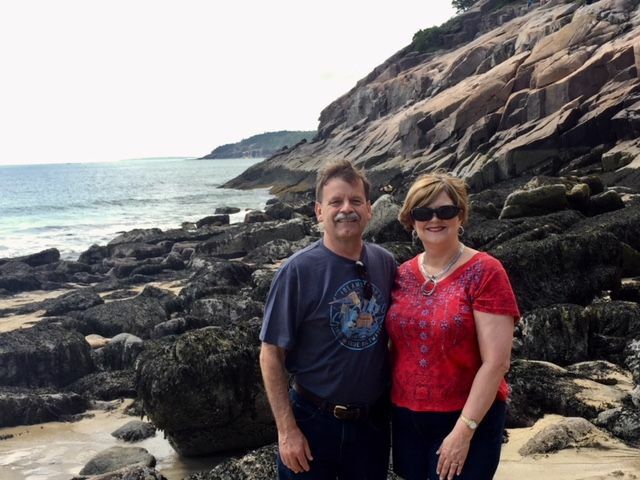 We spent most of our time in lovely Bar Harbor and had some wonderful meals there. Coffee Hound serves specialty coffee and artisan edibles. They are very knowledgable about coffee and get theirs from a local Maine roaster. SO FRESH. I had a delicious iced coffee there. My Maine friend says their Lobster Rolls are the best in Bar Harbor! 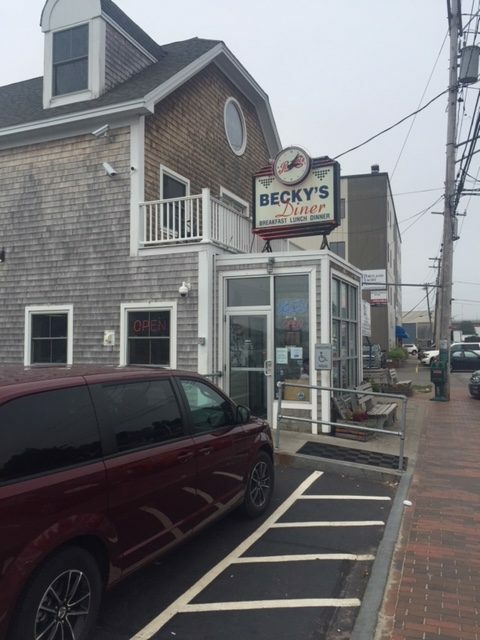 This quaint, family -owned Lobster Pound is a little shack with a friendly staff and outdoor seating under some gorgeous trees. They have traditional Maine Lobster Rolls. I enjoyed their customer favorite The Butter Sautéed Lobster Roll that is 5 oz. lobster meat sautéed in butter and served on a brioche bun. OMG it was good! 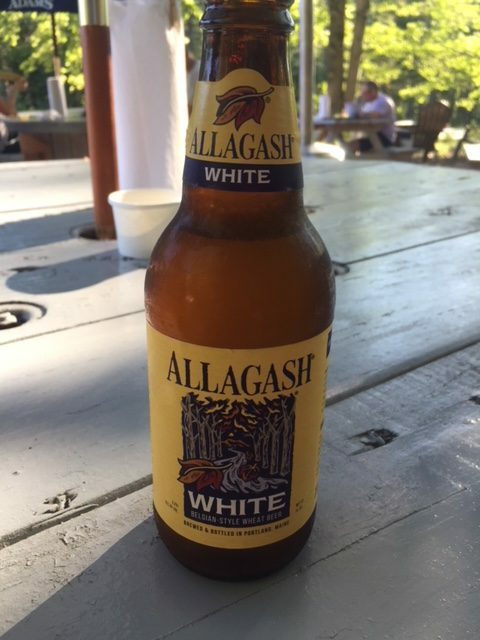 I paired that with a Belgian White from Allagash Brewery, a local Maine Brewery. In fact I had several of these beers on our trip! So good! This outdoor cafe that sits right on Frenchman’s Bay is the perfect spot for lunch, appetizers and cocktails. The views are stunning. We enjoyed a couple of happy hours at The Terrace Grille. The Blueberry Juniper Cocktail is a gin-based cocktail with fresh blueberries. Get it! It’s so refreshing. 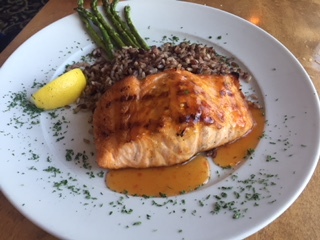 Located near the pier in Bar Harbor, Galyn’s serves fresh seafood and hand cut steaks. The decor with beautiful dark paneling, soft yellow lighting and leather chairs speaks old fashioned steakhouse to me. In fact, when we walked in after a day of sightseeing in our shorts and jeans, I feared that we were WAY underdressed for the venue. The staff could not have been more welcoming and assured us that we were dressed just fine. They seated us upstairs at a table by the window overlooking Frenchman’s Bay. I had the Lobster Dinner (What else? 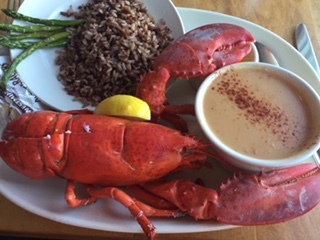 I told you I had lobster every day) with a side of Lobster Bisque and Tony had salmon. Both were perfectly cooked and beautifully presented. We had a great culinary adventure in Maine, thanks to some research, recommendations from friends, YELP reviews and some good luck. How do you find good restaurants when you’re on the road? One of the places that I’ve always wanted to visit is Maine. The thought of seeing beautiful lighthouses and eating lobster sounded great. And let’s get real. For this Texas girl, visiting anyplace in the summer with temperatures below 90 degrees sounded like Heaven. So when the time came for my husband and me to actually plan our trip to Maine, we decided to spend most of our time in Bar Harbor. 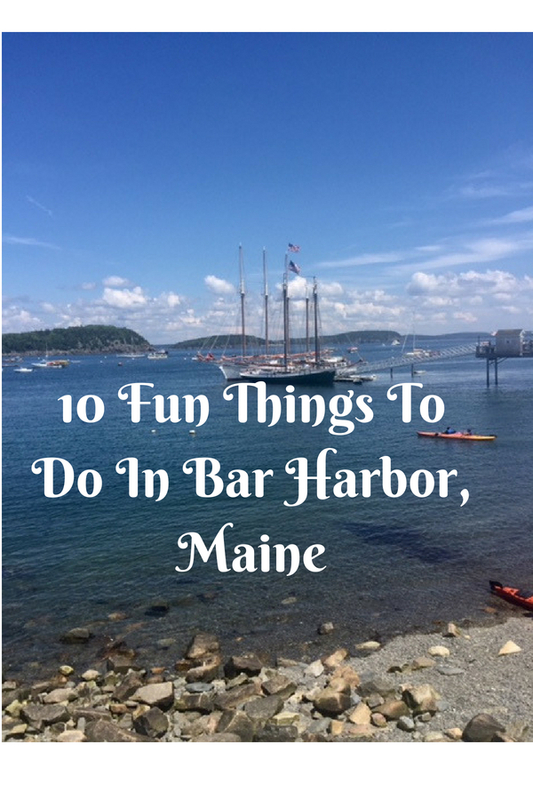 Here are 10 Fun Things To Do In Bar Harbor Maine. 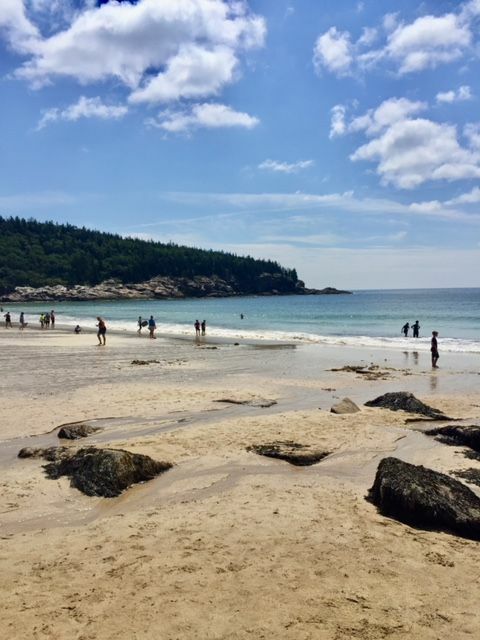 If you love beautiful scenery and outdoor adventures in the summer, Maine is the place. And for us, Bar Harbor, a tourist destination on Mount Desert Island, seemed to offer the most bang for your buck! Bar Harbor sits on Frenchman Bay and is right by Acadia National Park, which offers hiking, bike trails and beautiful mountains, ponds, and beaches to explore. 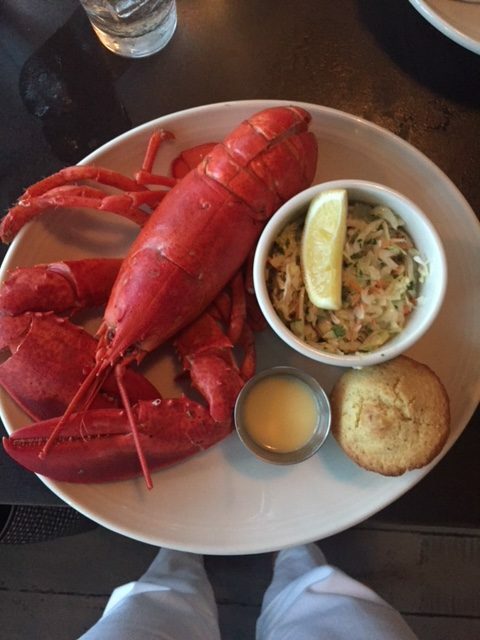 If you are looking for traditional Maine lobster, you won’t be disappointed. 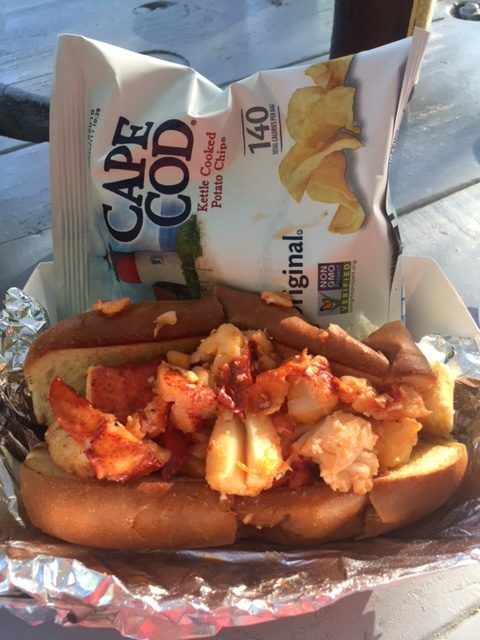 You can get steamed lobster and lobster rolls from many restaurants and lobster pounds. 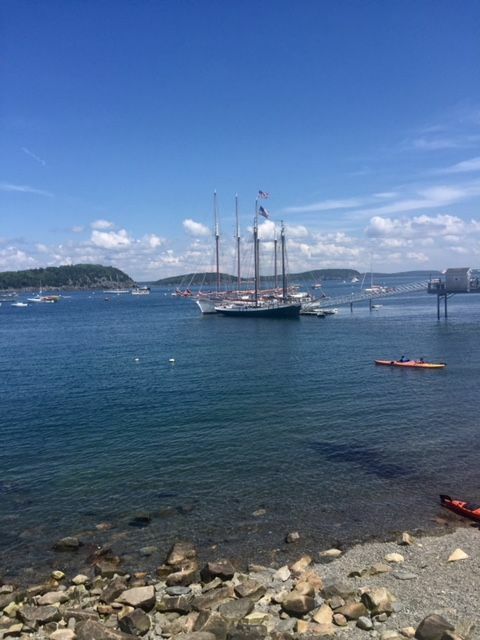 Bar Harbor is the place to enjoy the wonderful things that Maine has to offer. This post contains affiliate links for your convenience. If you make a purchase through one of these links, I may make a small commission at no extra cost to you. As with any tourist destination, there are a number of big and small hotels, bed and breakfasts, campgrounds and vacation rentals. We opted to rent a condo through VRBO. The one bedroom condo we chose was perfect for the two of us. It was 3 miles from the entrance to Acadia National Park and walking distance to everything in Bar Harbor. We started our day at the Hulls Cove Visitors Center to get our park passes. We were about to purchase the $30 pass for a private vehicle that is good for 7 days. However, a particularly astute park employee surmised that one of us may be 62 (and it wasn’t me…just yet) and suggested the Annual Senior Pass for just $20. This pass would get us into any National Park for a year. SCORE for being on THIS side of 50! We could have purchased the $30 pass online and not gone to the Visitor’s Center, but I’m glad we did. First, because they have nice bathrooms and for me, it’s always good to stop at a clean one before I head out ANYWHERE (can I get an Amen?). Secondly, I was able to talk to one of the park rangers about our plans and get some great direction from these very friendly and knowledgeable folks. We were there during the peak of the summer season in July, so the park was full of people and parking at the main attractions is limited unless you get there early. The Island Explorer Bus offers transportation to all the main park attractions from Bar Harbor or the Visitor’s Center. But after talking to the park ranger, we decided to chance it with our car because she said that the buses were often crowded and there was a wait to get to where you wanted to go. As far as transportation goes, it seems to be six of one, half dozen of the other. The main tip is to go and see what you want to see EARLY in the day. Sand Beach – This is a gorgeous 290-yard long beach nestled in an inlet with granite mountains on one side and the rocky shores of Mt. Desert Island on the other. Although the water temperature rarely rises above 55 degrees in the summer, we saw a few of the many people on the beach dipping their toes in the water. There is a lifeguard on duty from Memorial Day through Labor Day and changing rooms are available near the parking area. Hiked around Jordan Pond, which was formed by a glacier and is beautifully clear. There is no swimming or motorboats allowed so the atmosphere around this scenic place is peaceful and serene. I like to walk so I thought hiking the Jordan Pond Trail would be a great outing one of the mornings we were there. When I hear the word “pond” I often think of the tiny, man-made pond in my neighborhood. Don’t be fooled! 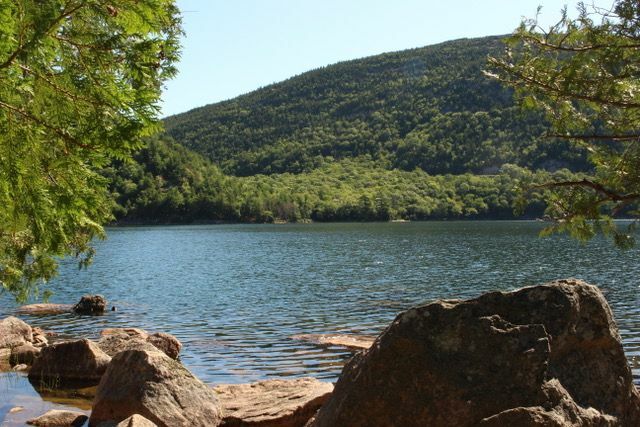 The trail around Jordan Pond is 3.3 miles. And although most of it is well-maintained and relatively flat, there are areas of large rocks you’ll need to walk/climb/step over if you want to make the full loop. But it is so worth it! Following our hike, we had lunch at the historic Jordan Pond House, which is right off the trail. Jordan Pond House opened in the 1800’s and is famous for its popovers. We arrived about 10:30 am and were able to get our name on the list to be seated at 11. Don’t be discouraged by the crowds. Jordan Pond House is large with both indoor and outdoor seating and the wait probably won’t be long. We lunched on lobster salad, blueberry lemonade and of course, Popovers! Cadillac Mountain – Standing over 1500 feet, Cadillac Mountain is the highest point along the North Atlantic seaboard and the first place to view the sunrise in the U. S. from October 7 – March 6. Getting there early to see the sunrise or going in the evening to view the sunset is one of the most popular things to do in Acadia National Park. We took the scenic Summit Road to the top of Cadillac Mountain in the afternoon, stopping at several of the scenic overlooks along the way. Each one provided beautiful views of ponds, the ocean, bays, and mountains. Truly breathtaking. 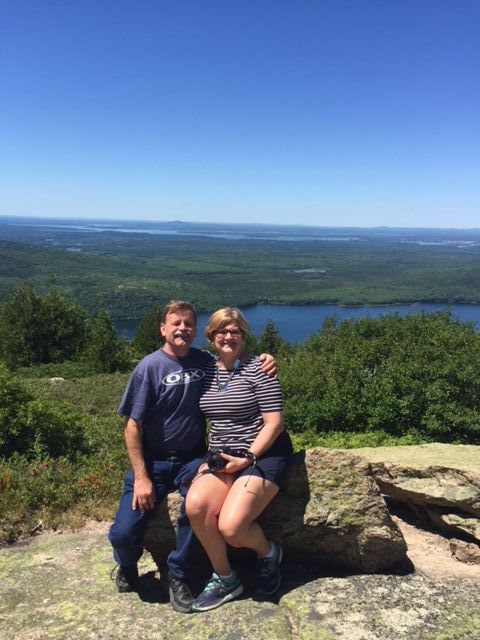 When you arrive at the Summit, there is a large trail where you can walk to different points and take some gorgeous pictures as you look down on Bar Harbor, Frenchman Bay and see the blue expanse of the Atlantic. 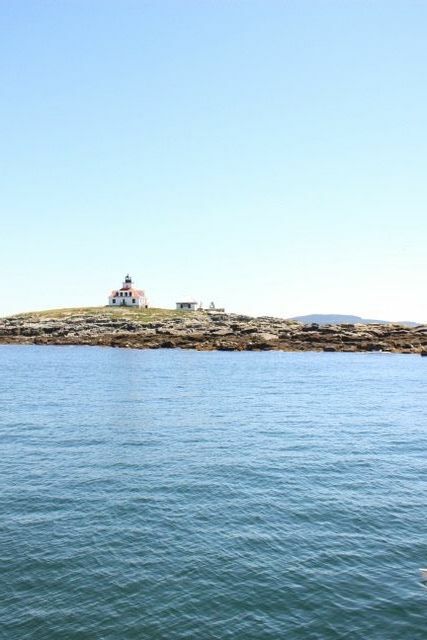 There are several cruise lines that offer whale watching tours in Bar Harbor. We chose to take Acadian Boat Tours Sightseeing in Nature Tour which promised that we would see some wildlife, not whales specifically. This tour was a 2-hour cruise with an extremely knowledgeable tour guide. We got lucky that day and we did see whales. Or I should say the blow holes and fins of some small whales. If you think you are going to see a Shamu type creature jumping out of the water, that probably won’t happen. Other wildlife we saw were seals, jellyfish, porpoises and a bald eagle that flew over us just like it was a scripted show! It was awesome to see. We also learned about the history of the area, saw some gorgeous “summer cottages” (mansions) and enjoyed the beautiful scenery of Coastal Maine. Pictured here is the Egg Rock lighthouse. I was so impressed with this tour company from the first person we talked to who guided me to a cruise where I would not get seasick to the captain and the tour guide. I highly recommend this company! Shop in the Bar Harbor Shopping District which is really the 5 or 6 streets that makeup Bar Harbor proper. Lots of specialty stores, touristy places, coffee shops, restaurants, and bars! Something for everybody! Explore all the things there are to do in Acadia National Park. Take a Ranger Guided Cruise or Bike Tour. Explore the many different places to hike or rock climb. Visit Agamont Park – a beautiful park on Frenchman Bay with plenty of benches to sit on and enjoy the scenery. Take a relaxing stroll down the Shore Path, which you can pick up at Agamont Park. Relatively flat and not too long. An easy stroll where you can see great views of the coast an islands in the bay. Have a cup of coffee at Coffee Hound Coffee Bar. Delicious hand-crafted specialty coffee and espresso. Dine outdoors or enjoy at a cocktail at Bar Harbor Inn’s Terrace Grille. The perfect location for outdoor dining overlooking the bay. 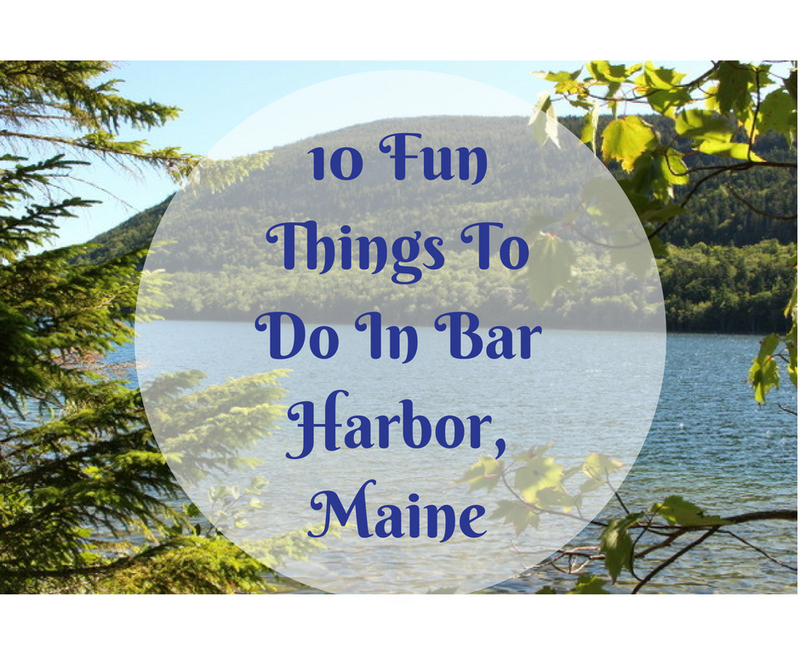 Have you been to Bar Harbor? What is your favorite thing to do there? Watch for my next post where I tell you about all the great places to eat in Bar Harbor! Every year I take a trip with my girlfriends. This year it was my turn to choose the location, so I picked Charleston, SC. 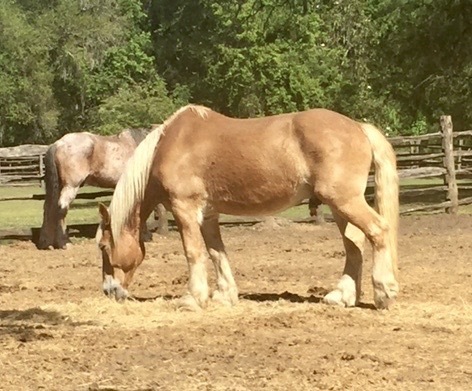 We went in early May and the weather was fabulous – sunny and in the 70’s. 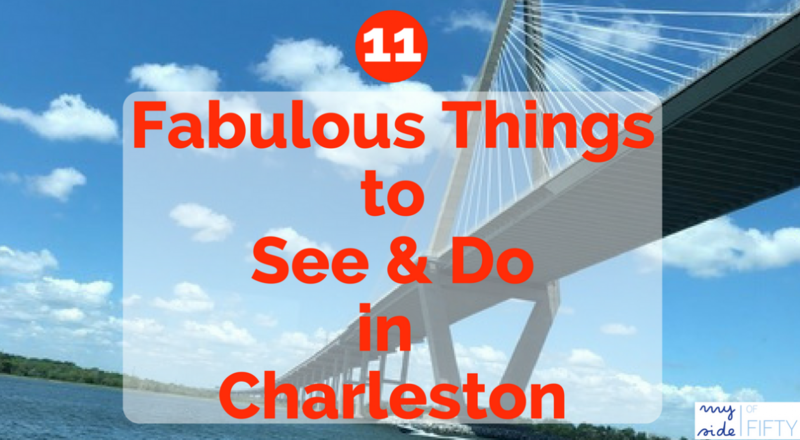 Here are 11 Fabulous Things To Do In Charleston. After we picked Charleston, we needed to find a place to stay, which wasn’t easy. Charleston is not a LARGE city by megacity standards. Places within Charleston proper are expensive. And we didn’t find out until we arrived that we were there on a major college graduation weekend, so I’m sure that contributed to the accommodation scarcity and prices! When we travel together, we like to have our own bedrooms, so we often look for a house to accommodate us house on VRBO. 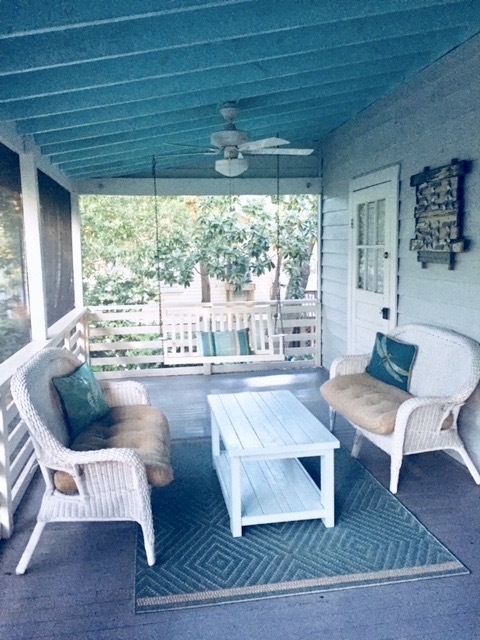 I found a cute little 4 bedroom beach cottage outside of Charleston at Folley Beach, complete with a screened in porch that got a nice breeze. We enjoyed our coffee and the scent of magnolias on the porch every morning. The location was great. 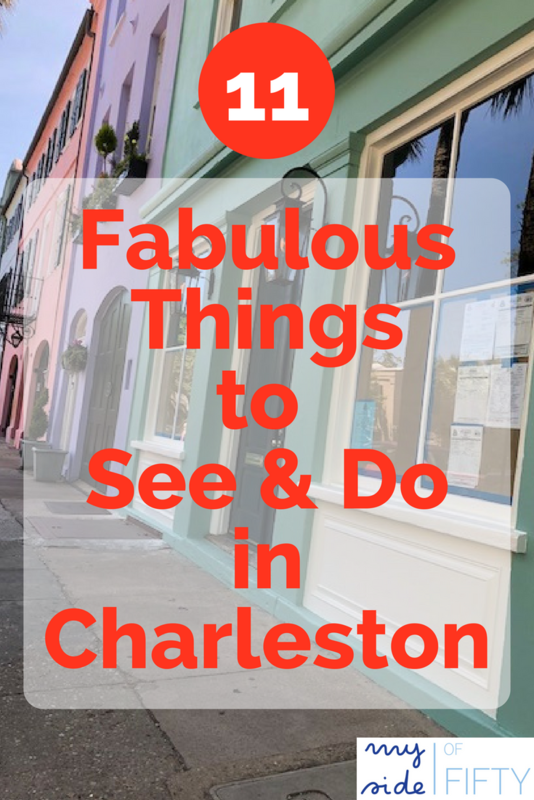 It was a 20-minute drive to all the places we wanted to see in Charleston. We started our first day in Charleston with a carriage tour around the city taking in all the historic sites. Doing this first allowed us to get our bearings so that we knew how to get around and see some of the other places we wanted to go. Since a carriage tour ride is the quintessential touristy thing to do in Charleston, there are numerous carriage tour companies to choose from. We booked ours through Classic Carriage Works. We booked an early in the day tour in advance, but we could have easily waited to book the tour when we arrived. Although we would not have had our choice of times, we probably would have been able to get on one within an hour. One advantage of going on one of the early tours is that you have a better chance of finding a place to park your car for the day since downtown parking is VERY LIMITED. There are several types of tours you can choose from, depending on your interests. 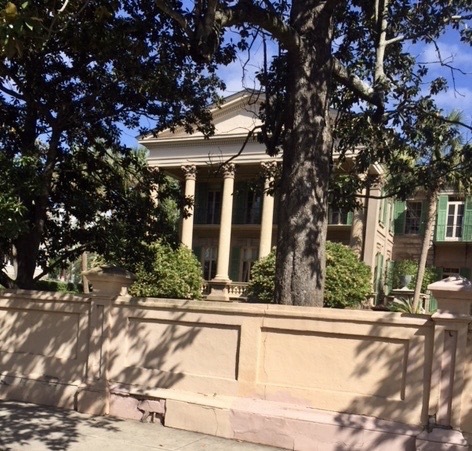 We took the Charleston History Tour. There is also a Civil War Tour or Slavery to Freedom Tour. Private tours and adults-only tours are also offered. We had a super fun (and handsome) tour guide who gave us an hour tour through the historic district where we saw lots of homes (including Patricia’s from Southern Charm) and historic churches. 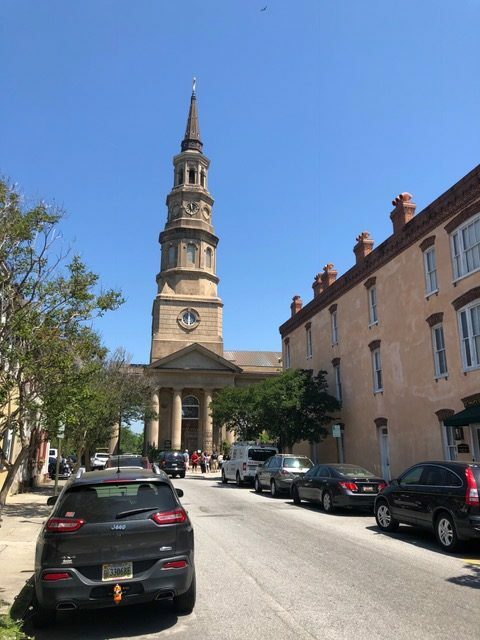 Did you know that Charleston is often referred to as the “Holy City” because of all the majestic steeples and spires you can see as you drive through town? After our tour, we took a short walk over to the Charleston City Market, which is a historic open-air market where slaves used to take their wares to sell. In addition to touristy things, they have crafty and handmade items, a great lemonade stand and clean restrooms. 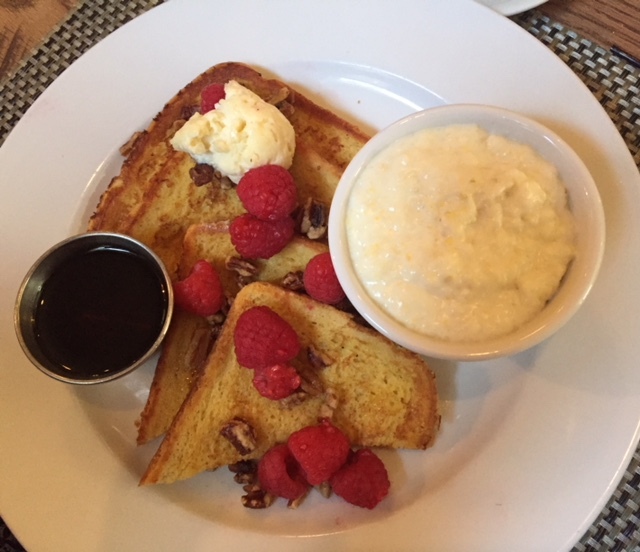 Next on the list was brunch at Poogan’s Porch! OMG, was that wonderful! 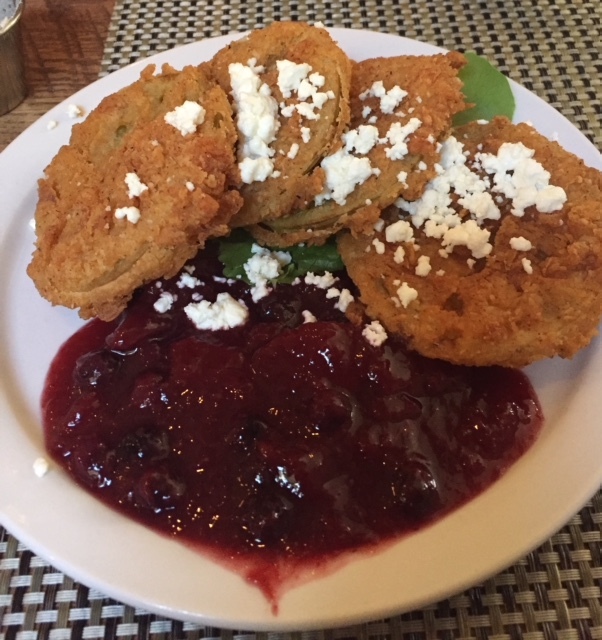 I had the BEST Bloody Mary made with Dixie Black Pepper Vodka, Charleston Mix & pickled okra, followed by an appetizer of Fried Green Tomatoes with Peach and Blueberry Chutney and a main course of Shrimp & Grits. You don’t get much more Southern than that. 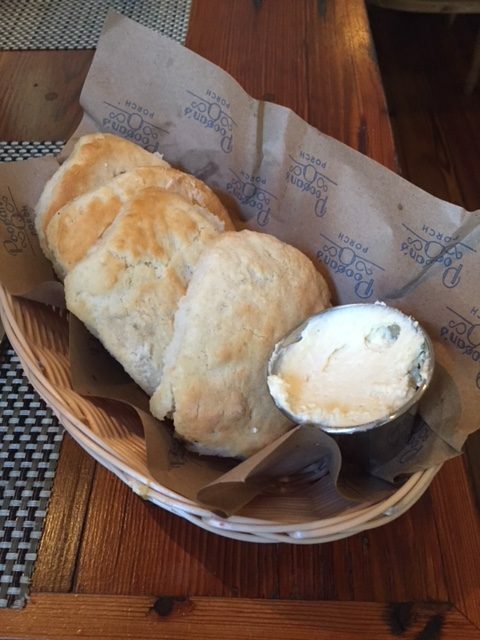 And lest I forget the biscuits…. 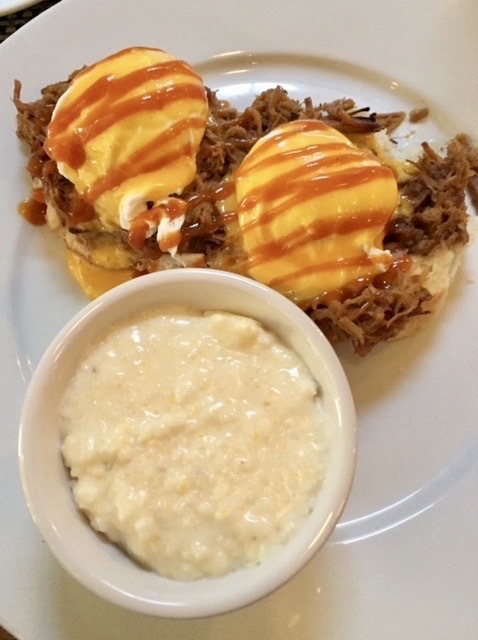 Other favorites: Pogan’s Salty Dog, Pulled Pork Benedict & French Toast. 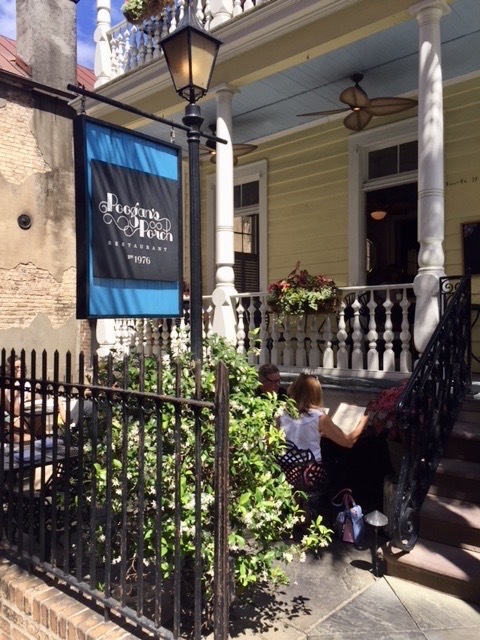 Restaurant Tip: Many of the most popular restaurants in the city are open daily for brunch. Great option if you can’t get a dinner reservation or just want to go to brunch. We spent the afternoon on King Street – a LONG street for shopping. One end has unique high-end boutiques, antique stores, and art galleries. The other end has more of the luxury retailers you’d see at home. The cemetery at the 2nd oldest church in Charleston is a beautiful spot with gravestones dating back to the 1700’s. The pathways are maintainted for visitors, but the plots and grave markers have been given over to nature. Vines, shrubs, and trees grow among, around and through the cemetery. 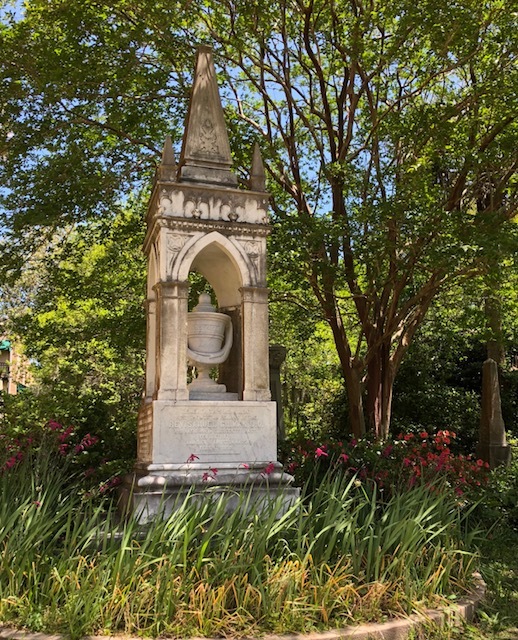 Ghost Tours of Charleston even offers a tour of the cemetery at night! A street with beautiful homes in a rainbow of colors. One of the prettiest streets in Charleston. The Charleston Tea Plantation is not a plantation in the “Gone With the Wind” sense, but an actual working plantation where they grow tea. In fact, it’s the only place in the US where tea is grown. The plantation is picturesque with huge trees and a nice picnic area. They have a large gift shop with many different varieties of hot and cold tea to sample. If you are interested in how tea is cultivated, take the 45-minute trolley tour. We had a delightful tour guide and the tour was most informative. If your time is limited and you are not SUPER INTERESTED in tea, I would skip this. 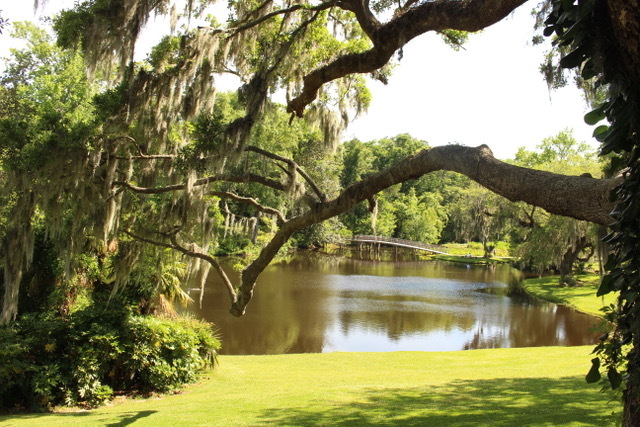 Middleton Place is the home of the oldest landscaped gardens in America. 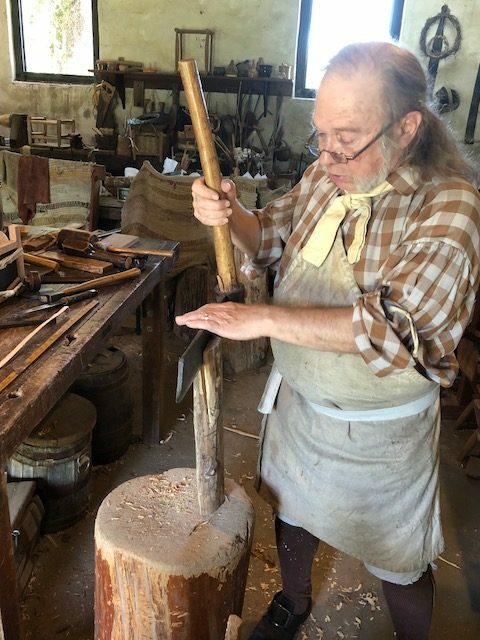 When you visit, you will see 65 acres of formal landscaped gardens, and get a look at 18th and 19th-century plantation life with costumed craftspeople and historic animal breeds in the plantation stableyards. When I heard about the gardens, I thought of flowers. There aren’t many flowers, but it is a gorgeous place with big trees, ponds, creeks and sculpted bushes. There is so much to see and do, I wish we had started our day there. If you go to Middleton Place, make it the first stop of your day. There is so much more to see and do there than we were able to do, including a tour of the original house. 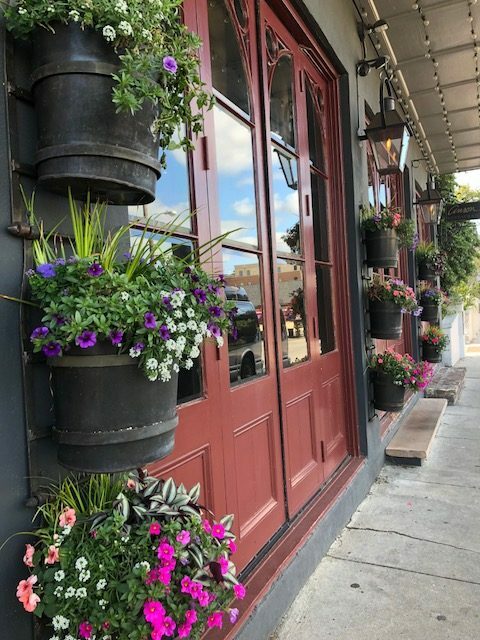 Dinner at this lovely farm to table restaurant features house-made pasta and dishes made with primarily locally sourced food. Pasta and seafood are outstanding! 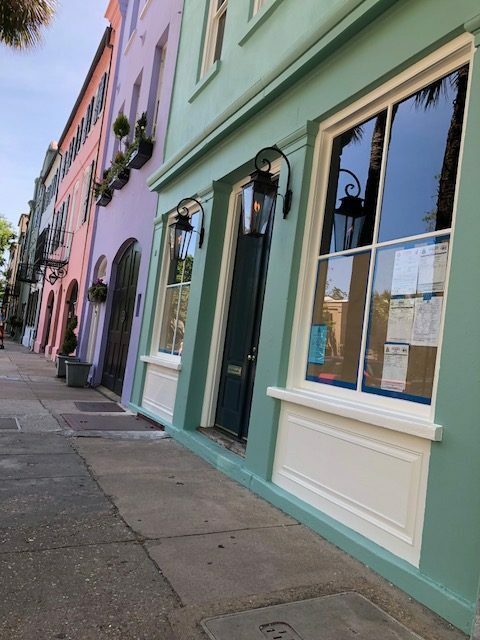 A little breakfast and lunch place off the beaten path featuring all your breakfast and lunch favorites – bagels, biscuits & gravy, eggs benedict, sandwiches, salads, and wraps. My favorite – Blackened Salmon BLT Wrap with grilled blacked salmon, fried green tomatoes, crumbled bacon, romaine, and Cajun mayo. This wrap is HUGE. You could definitely split this with someone. Authentic French Cuisine in a casual, family atmosphere. Delicious steaks, seafood, Southern fare. Get the Flounder Nicoise and don’t’ miss out on the Bacon Cheese Grits. We had such a wonderful time in Charleston. I wish we had had more time. Put this on your list of the best girl’s trip destinations! This post was sponsored by Allianz Global Assistance. All thoughts and opinions are my own. As I sit down to write this post, it seems like most of the U.S. is experiencing blizzards, ice and altogether miserable winter weather. And what else is there to do when you are stuck inside on a super cold day? Start planning your next vacation! You’ll likely have so much fun planning where to go, how to get there, where to stay and what to do. 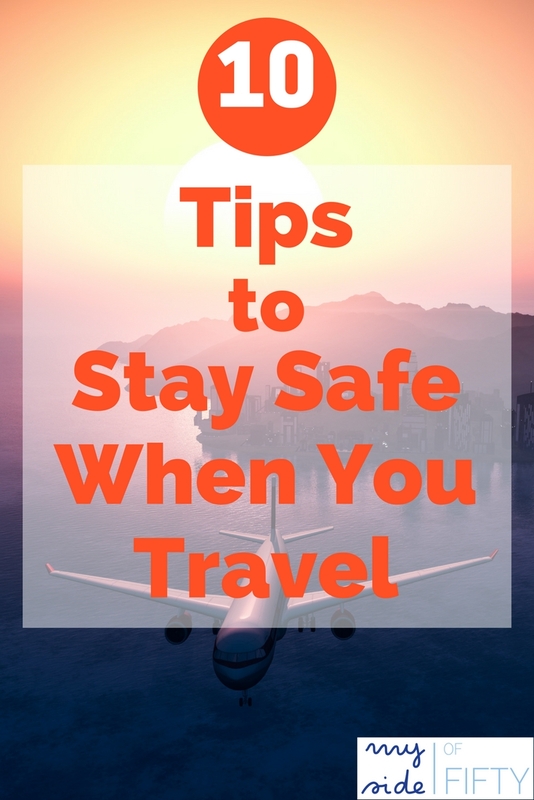 But do you ever make a plan for travel safety? How to keep yourself, your belongings and your identity safe in the new places you’ll go? 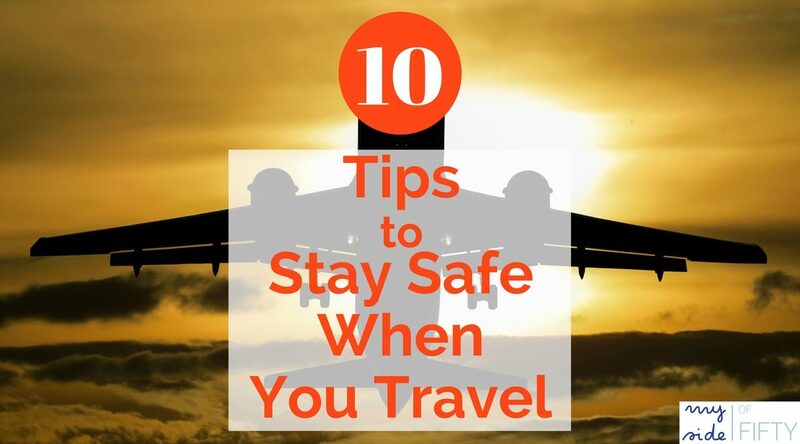 Here are my Top 10 Tips To Stay Safe When You Travel. In big cities, you should know the areas which are safe and those which are dangerous for tourists. Travel like a Local: When visiting any location, know your surroundings and plan your route in advance. Be aware of how the locals talk and dress and avoid actions that will make you “stand out” as a tourist. Check out travel guides and reviews before you take any excursions, tours or adventures. You want to make sure that the vendor is reputable and that you will get what is promised, have a good experience and are safe. Don’t post itineraries or locations on social media! Posting your itinerary or location on social media allows potential thieves to keep track of where you are, making it easier for them to time a crime – both where you are and at home! Wait and share all those vacation pictures when you get home. Don’t leave your bags unattended. You’d think that would be obvious. But it’s amazing how many bags are stolen when you set them down just for a minute and aren’t looking (think the baggage claim at the airport). If you aren’t vigilant, you are a target for thieves who are very adept, fast and determined to steal your bag. Only carry in your purse or wallet what you absolutely need. Take just the credit cards you’ll be using, your ID and cash for the day. If you must carry your passport, carry it close to your body. Keep a record of important documents in a place other than your purse or wallet. If your wallet or important documents like your driver’s license, credit & debit cards, and medical insurance cards get stolen, this will help you know who to call and what to tell them. Don’t show your valuables around. Walking around with your big, expensive camera around your neck, especially in an area where the value of that item is several times the local monthly income could be a problem. Put things of value that you must carry, like your technical devices in a daypack and only take them out when you need them. Password protect your phone. Your phone stores sensitive information, such as access to your emails, and possibly even credit card information. If your phone is stolen, you don’t want thieves to be able to easily access it! Financial protection if your trip is canceled or interrupted for any reason. Hotline assistance, which is especially helpful if you are in a country where you don’t speak the language. Travel insurance policies, such as those offered by Allianz Global Assistance, are designed to cover you with financial safeguards in the case of events ranging from inconveniences to calamities. Coverage may include both costs incurred before your trip, such as nonrefundable event tickets or hotel stays, and during your trip, including travel interruptions and medical expenses. You may think you don’t need it because you have certain safeguards with the airlines, cruise lines or travel agent you use. But maybe not. For example, did you know that airlines aren’t obligated to do anything when your flights are delayed? When the airlines are the ones at fault, they may offer some assistance, but they’re not bound by law or duty to do so. There are a number of similar misconceptions that travel insurance can guard against. Insurance comes packaged together with specific coverage benefits – the type and amount will range based on the provider and the package selected – that fill gaps where your travel plans may be exposed to a number of threats. What kind of threats? Take lost baggage. Lost and damaged bags are the No. 2 complaint issued to the Department of Transportation. Additionally, while domestic airlines safely transport more than 99 percent of all luggage, international carriers still lag behind. Trip Cancellation Protection. This is the big one and includes reimbursement for non-refundable trip payments and deposits. Trip Interruption Protection. Sometimes trips start on time and end prematurely due to forces of nature and other circumstances beyond your control. This benefit includes reimbursement for unused costs and transportation costs to return home. 24-Hour Hotline Assistance. While this doesn’t come with a dollar amount, getting real-time help when you’re in a pickle is invaluable. Especially if you don’t speak the native tongue. This can include the arrangement of evacuations for medical emergencies, pre-trip assistance, etc. Coverage for financial default. What if the tour operator for your upcoming family vacation stops answering your calls? And then the line is disconnected and the company is out of business. Travel insurance may be your most reliable means of financial recourse. Among the first considerations to make when selecting a travel insurance plan is whether to pursue trip-specific or annual coverage. Frequent travelers and those with a big family or young kids may want to carefully consider the cost savings that an annual plan can provide. It’s not hard to do the math: when travelers add up the piecemeal cost of insurance for the trips they plan to take in the next year and compare it to the annual price tag, there will be a more attractive choice. At Allianz Global Assistance, offerings range from the affordable and simple Essential Plan, which may work for the quick weekend getaway, to the Classic Plan with Trip +, which is designed for families traveling abroad who may experience any number of unforeseen challenges and inconveniences. Travelers can find the plan that’s right for them by visiting the Travel Insurance Plan Finder. One final note about travel insurance that doesn’t come with fine print or footnotes – and that’s peace of mind. It’s a product you hope you never need to use but appreciate when you have it, similar to other insurance products. Once you weigh the importance of this peace of mind, as well as the other factors outlined here, you’ll be closer to being able to decide whether travel insurance is right for your next trip. Planning an Alaskan Cruise? Get the Ultimate Packing List for Your Alaskan Cruise here. Traveler’s constipation. Is this a problem for you? If so, you are one of the estimated 40% of people who suffer from constipation when you travel. Talk about a way to mess up a great vacation! 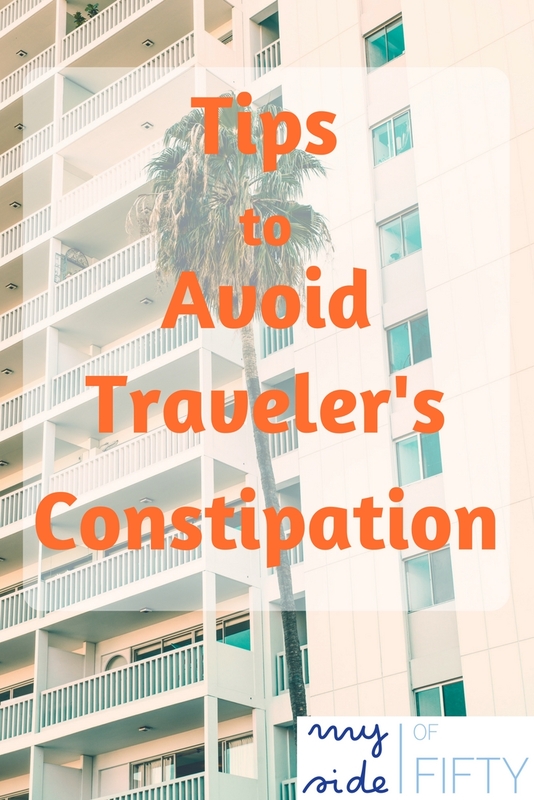 Why do people suffer from traveler’s constipation? Different meal times, sleeping schedule and jet lag can throw off your circadian rhythm and affect your digestive process. Safe toilet syndrome – not being able to relax enough to go in an unfamiliar bathroom. 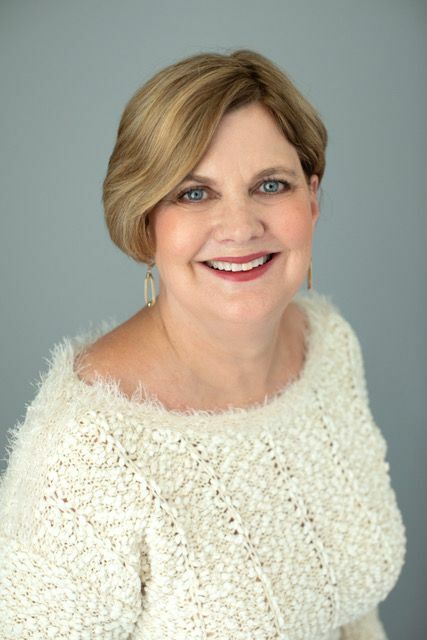 Today, I am pleased to introduce Jess Brassington, a nationally certified holistic health coach who empowers her clients to take control of their health through food and lifestyle changes. Here, she shares her experiences with traveler’s constipation and how she “nips it in the bud” before she even starts a trip. Are you ready for vacation and a little travel time? There is so much to do. Are you prepared? Finding your luggage. Picking out just the right outfits. Deciding on regular or travel size toiletries. Figuring out how many pairs of shoes you can bring. But… did you remember to include your digestive health? I don’t know about you, but many times in my past travel efforts, I had a history of not being able to go the restroom ( at all ). It was so frustrating! My husband and I decided to get away on a much-needed trip, alone! We chose the Bahamas. A place you don’t want to think about constipation and being miserable. I knew we would be around many public restrooms and of course, my fear of pooping (yes, I said the *P* word) in public restrooms doesn’t ever help a situation where there is a problem already. If you’ve ever had a fear of “going” in public restrooms, read here how I overcame my fears! Who wants to be uncomfortable when you are planning a romantic getaway? Or a special trip with your family? Not me. I’d had enough of this problem! I decided I wouldn’t let this problem affect my travel plans and my much needed R&R. I made up my mind to be intentional about digestive health BEFORE I left for a trip. This is what I do now to prepare for traveling away from home. I’m BIG on probiotics, prebiotics, enzymes, and great gut health in general. So many Americans suffer from symptoms stemming from an imbalance in their guts due to stress, processed foods, medications, etc. I take these daily but it’s especially important before a trip. You’ll be flying, exposed to a new area, foods, and germs. Support your immune system to keep it healthy and create a better environment to handle these changes and remain above the wellness line. I bring probiotics along with me on travels and make my husband take them also! Probiotics help restore the “good” bacteria in our guts that are often killed off by environment and lifestyle choices. Professional Supplement Center has a great selection of high quality probiotics. Do you experience traveler’s constipation or other tummy issues while traveling? If so, let me know! I want to help and bring more tips people need! From Cathy – I love Jess’ idea of getting ahead of the issue by taking probiotics. 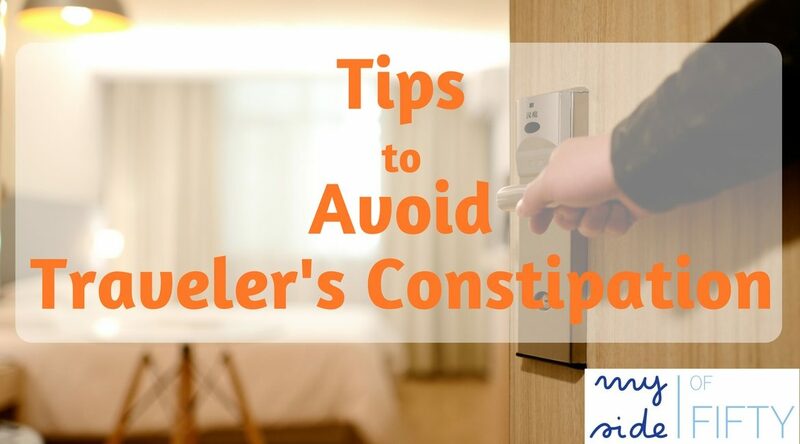 But there are also some things you can do while traveling to help avoid traveler’s constipation. Take a walk when you wake up. Exercise increases the motility of the GI tract. Don’t sit for too long. If you are on a long flight, set a timer on your phone and take a walk every hour. If you are waiting in the airport – walk around. Don’t sit waiting for your next flight. Traveling by car? Schedule regular breaks to stop and get out of the car. Don’t skimp on fiber. Most of us don’t think a lot about fiber when we’re traveling. We’re focused on decadent treats and enjoying regional favorites – at least that’s what I do! You can still do that, but be sure and include produce at every meal and have fruit for at least 1 or 2 snacks. Drink lots of water. This will keep you from getting dehydrated and helps fiber more effective. Do experience any kind of “digestive distress” when you travel? What are your tried and true methods to remedy those painful and inconvenient episodes? Have you heard of Lyft? I had not until I took a trip with my girlfriends to Nashville. The “girls” who took this girlfriend trip are actually middle aged women with 13 grandchildren between the four of us! In planning our trip, we decided to stay in a house we found on VRBO.com in the Nashville suburbs. Hotels near the downtown area where a lot of the action is were VERY EXPENSIVE and the 4-bedroom house we rented worked perfectly for our needs. At the suggestion of our landlord, we used the LYFT app to take us everywhere we wanted to go. Download the LYFT app on your phone. Set up an account using your e-mail and a credit card number. Select the size car you need. Verify your pick up location. Enter your destination and request your ride. The name and a picture of your driver. The license plate number and model of the car that will be coming. The estimated time of arrival. When your LYFT driver arrives, you will get a call or text. Just hop in the car and you are chauffeured to your location. You don’t need cash. When you arrive, you verify the payment on your phone with the option to add the tip. It’s fast and convenient and if you are traveling, you can’t beat it. It was economical. Parking in Nashville is scarce and expensive. We saved money splitting the cost of a LYFT. Plus we received discount referral codes from our VRBO landlords, from our LYFT drivers and for sending LYFT referral links to each other. We didn’t have to worry about finding the places we wanted to go in an unfamiliar city. Our drivers were very knowledgeable about Nashville. From great places to see to restaurants, these locals were a wealth of information that you won’t get on any travel site. 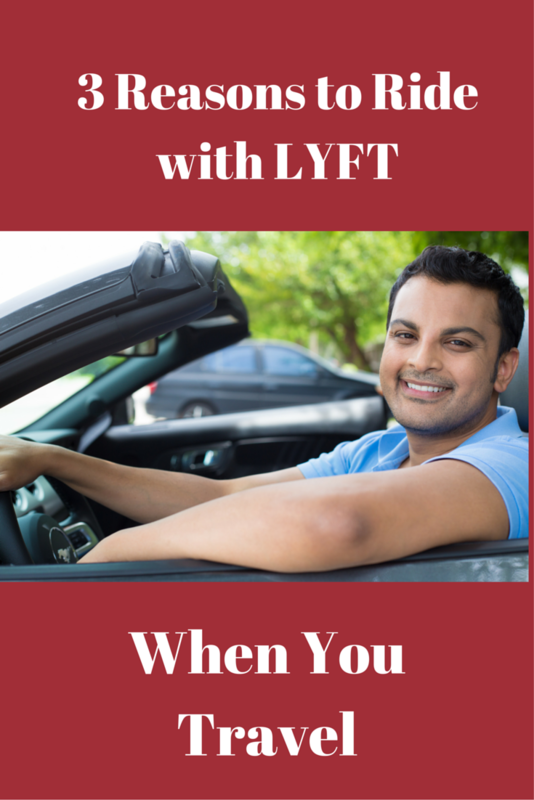 Now for the good part – not only do I LOVE LYFT, I just so happen to have a referral code for up to $50 in free rides for new subscribers to LYFT. If you have never signed up for LYFT, enter this code when setting up your account and you will receive the discount that is being offered in your city. 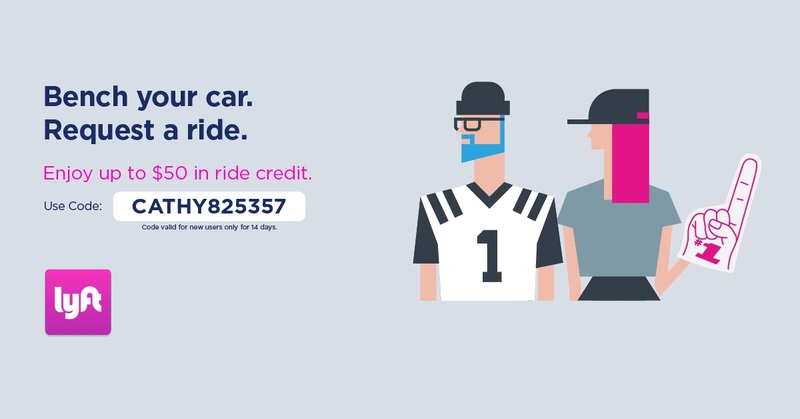 Up to $50 in LYFT ride credit. Here is the list of cities where LYFT is available.